** the poem "She Calls Once That Is a Lie" was published in Nepantla Journal's inaugural issue. With every Jewish, Spanish, and English word, SOLECISM reveals a map of crossed borders and cultural voices that do not seek to be pinned down but to travel freely and infinitely across lands. The identity of the speaker is just like its language— ridden with paradoxes and compounds that one could perceive as unusual but that in their beauty and craftsmanship make perfect sense in the heart. Just like this, Rosebud Ben-oni withholds nothing and claims the reader's sight, hearing, and everything. Note: Solecism has been such a delight to read. I have always been interested in how writers with multicultural backgrounds manage to put together the “multi” in “one,” how several identities and landscapes can exist in a single textual context. Through her book, Ben-Oni proved to me that this is not so different from our very selves, as we have and are so much more than a one-dimensional identity trapped in one body. 1. Thank you for doing this interview for us. To start it off, I must say that the cover is beautiful. The colors are just amazing! It is noted inside the book that the cover painting was done by Rogelio “El Indio” Cisneros and the cover design by Regina Schroeder, but could you tell us more about how you came to decide on the final picture and how you feel it represents Solecism? Rogelio Cisneros is my uncle, my mother's brother-in-law. He’s mixed (Mexican and Native American), and had worked on the border in Tijuana and Chula Vista, California, for many decades. He’s a tall, imposing figure, and looks very serious when you first meet him, and yet he and his wife, my Aunt Olivia, were the life of the party in our family. Like most of my mother’s family, they had a strong presence in my life. When I attended college, my aunt wrote me long, long letters about their life together, about growing up in the Rio Grande Valley in Texas and driving all the way to California with barely any money, only to have their car break down on the way there. In California, they became involved in the Chicano movement early on, vocal in their politics, and then they could dance like no one’s business. Uncle Rogelio finally retired about seven years ago, and he’d plan to focus on his art, but then my aunt fell very ill; he now cares for her full time. In the summer of 2012, a few months after I’d had my book accepted for publication, I went with my parents to see them in Chula Vista. He showed me some of his paintings, and the ones of the wolves were incredible. The wolf on the cover of my book was actually his own pet wolf. Yes, he kept a she-wolf in the suburbs of San Diego. Whenever she’d howl at the moon, he’d tell the neighbors that her breed had a very peculiar relationship with the phases of the moon. I loved this story. I then wrote to my publisher, Steve Schroeder, about using one particular painting as the cover. Luckily, the publisher said yes. And so that’s how it happened. I chose this painting for the cover because, to quote “Burning She-Wolf” by Vasko Popa, one of my favorite poets: “With her teeth the shewolf reaches/ The blonde braid of a star/ And climbs back to the base of the sky.” As a child I was often this kind of animal, always returned to this animal, no matter what new discovery. As a poet, I shift in and out of this animal, unfollow the scent of the pack, the pack the childhood selves out of which these poems in SOLECISM first spring forth. 2. Throughout your book, you employ untraditional grammatical structures and juxtaposition of ideas. There is a beautiful play of words present as you compound words like “razor-wild” or “leather-rebellious” and compose paradoxes in phrases like “born a muerto.” What is the inspiration behind the title and theme of your collection of poems? What was the process like of writing in such a solecistic way? As I preface in the book, solecism is defined as: nonstandard or ungrammatical usage; breach of good manners or etiquette; any error, impropriety or inconsistency. I am guilty of all these. If the place of return (rather than home) is the wolf, then my spirit animal is doubt. When I was putting the collection together, I realized that the journey here was not to seek redemption, but to explore a multicultural experience of warring (and often contradictory) doubts and lay it all out to see what that journey looked like. Migration as a way of life, so to say, rather than a means to an end. That was where I was at that point in my life as a poet and as a human. 3. There are instances when a sort of exoticization of a person or experience takes place in your book. For instance in “The Reply of Sal Si Puedes,” you write, “Quit photographing my children for/ exposés of The Second Coming.” In “For the Mixed Child with Pale Skin,” the child must pose with a macaw on his shoulder to “draw out the exotic.” In “Proof of Absence” people ask what it is like to survive a bombing and are surprised by how the speaker compares it to something as banal as “bad music.” Could you share with us how you further explore the idea of the exotic in your book and whether you had in mind the notions of gazing and othering? I’ve had some interesting experiences with the dominant discourse; that I had a mentor tell me that she found my poems with “Jewish” subject matter to be more “mature” than whatever my “picturesque” Mexican side could ever bring out. I had a grown man tell me he’d been to Mexico once, and that the poverty there was more “romantic,” and that the people “weren’t unhappy there.” A man with a Ph.D. and tenure. Telling me. To my face. This sort of thing continues. Just recently I had a white, straight, male poet write to me that with the “changing” landscape of poetics, he found himself listening more than speaking, and that he wasn’t used to that, and that he felt disempowered by it. He jumped off from there, and wrote that, given his recent experience, he was struggling to find some way to identify with some of the poems I’d written in SOLECISM. That while he liked me as person (I should mention we’ve never even met), he believed that it was heavily implied throughout the book that I was blaming him, or rather, directing my “anger” at all white, straight, male poets. I was taken back by this (half of the poems aren’t even set in the U.S.), but also curious as to why he had to identify with these poems at all. I think that’s part of the problem, that one has to identify with the poet. Why not just listen? I’ve been listening all my life to the dominant discourse. It’s called K-12. It’s called Survey of American Literature. It’s called Pedagogy. It’s called Well-Meaning Mentors who Ask You Where Are Your Tortilla/Abuela Poems? Weaving in and out of those is the power of the gaze, the exoticizing, the othering. In the end it couldn’t be a conversation because he was offended. He stated again that said he had been listening, but where did that leave his voice? I found the whole thing very strange: he was trying to “other” himself by thinking he had to be a victim, to show that he was under attack. I have friends whom are white, straight and male, and they are finding plenty of places to publish their work, so I couldn’t really see his point at all. I think too many people are hung up on the idea that there needs to be one, solid idea of U.S. poetry, one spirit animal, one voice that we can all identify with. And those kind of people wanted to see it represented in a way that reflects their own beliefs and agendas. Well, good luck with that, honey. Maybe it’s because I’m mixed, but trying to fit every single person in this country within those kind of confines is a recipe for disaster. Because those like me will always escape the box, and live outside of it. And you will have to “listen” even then. 4. I love these two verses: “I am the mistress of fragmentation” and “You are not the first to break/ into restricted areas// wanting nothing at all.” I am very interested in hearing what fragmentation means for you in relation to remembering the place where the fragments come from and crossing boundaries. Sometimes it’s just about the breaking and breaking in, rather than to collect something. What about coming to the crossing and seeing what’s there first before going forward or heading back. I’ve lived on physical borders, in the communities that have sprung up there. Fragmentation for me is my origin as a poet. It’s where I still rest my head at the end of poem, a line, a thought. I long for something whole, though, which is why the breaking in. I’m drawing a line in the sand close to the surf coming in. I’m cutting though an old shoe climbing a fence of razors. I let the foot bleed, the mark wash away. I write. Sometimes I fragment things that think themselves whole, that think they can only exist one way. I cross them over into a new world, I make them awkward and silent and misunderstood. 5. Animals seem to be recurrent in your poems, especially winged ones like locusts and birds (sparrows and pauraque). How did they come to you? And what kind of place would you say they have in your life and poetry? Is there any connection between them and the concept of journeying and flying over borders? Once after a snowstorm, I saw this sparrow sitting on a patch of snow outside my bedroom window. I thought it was dead because it was so cold. But then someone passed by and it flew up into the air, and then down back on the same place. It began to preen. It sat there for a long time. This is totally the poet speaking, but I swear that sparrow was mocking us with our coats and scarves and boots, rushing to our warm homes, that it could sit on a pile of snow just to show how tough it was. I think of the film Days of Being Wild. There’s this line from the movie in which Leslie Cheung says: "I've heard that there's a kind of bird without legs that can only fly and fly, and sleep in the wind when it is tired. The bird only lands once in its life... that's when it dies." In SOLECISM, the speaker begins as this bird. Because I've have been that kind of bird. Now, I’m still this bird. But I'm not completely of it. But how I once was, in entire. Given over to reckless things, leaving too many people and thing, leaving, leaving, always leaving. And as I wrote, slowly the layers of this bird peeled off because I was forced to land as I wrote. And I didn't die, entire. As a poet, I'm still peeling, letting go the sum of all those one-minute peccadillos and larger transgressions. And in this book I gather the peels. And in the book some give way to sparrows sitting in the snow, while some burn, remain burning, a kind of forever in flight like Cheung’s bird who can’t land. Both make up the journey. Both have flown over borders in way I can as a poet, in a way I can’t as a human. 6. Your biography says you were born to a Mexican mother and Jewish father. In Solecism a rich interaction between cultures and religions can be found; Spanish, Hebrew, and English words meet in a single poetic context, and the speaker interacts with God, Ishtar, and the Virgin Guadalupe in his/her life. Please tell us where (or how) you find your identity (do you feel a necessity to find it?). Would you say these poems are autobiographical and that you find yourself in your writing? The poems are rooted in many histories, both personal and generational. I am writing about my multiple selves who have communed with Ishtar, the Virigin Guadalupe and the Jewish God, and those selves have been reimagined. What I find in a lot of these poems is that the poet searching for home and for a homeland, which are two very different things. These day I don’t worry too much about finding my identity anymore—it’s there, in fragmentation. Mixed heritage can be an origin itself (I wrote about that here). Putting together SOLECISM as a collection was a way of discovering this idea, that one can exist in plural and also hold dear conflicting national/religious/social histories. That one can house them all in the manner that they work perhaps nowhere else, and break with them when she or he chooses. My Mexican identity is one rooted in family; it is because of my mother’s family that identity is so strong. And while I still identify as Jewish, it has less to do with the communal aspect of Jewish life, though I might return to it someday and join a synagogue again. I miss the sound of the shofar during the High Holy days, attending Shabbat services, building a sukkah. But these things live in the poems, so they can’t be taken from me. Sometimes I’m still Cheung’s bird who falls asleep in the wind, but after the publication of this book, I now awaken on much more certain ground. No matter what, I land. And I awaken. That is the finding, the continuing. 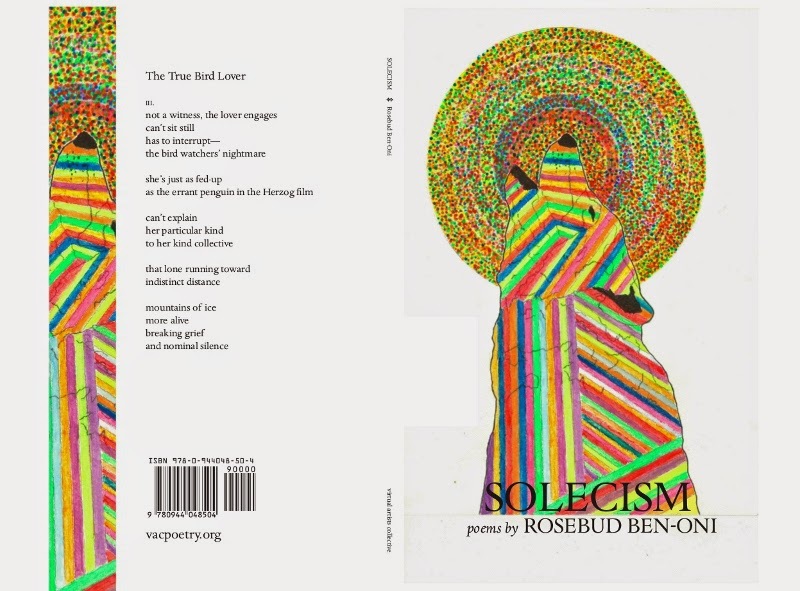 Born to a Mexican mother and a Jewish father, Rosebud Ben-Oni is the author of SOLECISM (Virtual Artists' Collective), a CantoMundo Fellow and the recipient of a 2014 Poetry Fellowship from the New York Foundation for the Arts (NYFA). Her work appears in POETRY, The American Poetry Review, Arts & Letters, Puerto del Sol and elsewhere. In 2010, her story “A Way out of the Colonia” won the Editor's Prize in Camera Obscura. A graduate of the 2010 Women's Work Lab, she is a playwright at New Perspectives Theater, and also at work on a new play. Her plays have been produced in New York City, Washington DC and Toronto. 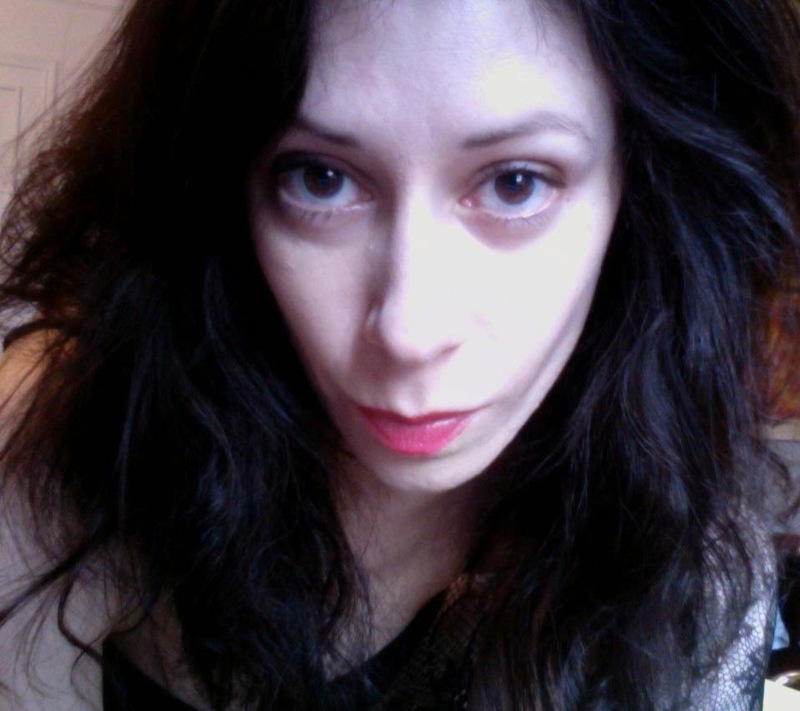 Rosebud is an Editorial Advisor for VIDA: Women in Literary Arts, a Newsletter Columnist for Kore Press, a Contributor to The Conversant and at work on her first novel, The Imitation of Crying. She has served as Guest Editor for several publications including [Five] Quarterly and Winter Tangerine's IMAGINARY HOMELANDS feature. She is also completing her second book of poetry. Ae Hee Lee is a South Korean by birth and Peruvian by heart and memory. She is currently an MFA candidate in the creative writing program of The University of Notre Dame and works as a graduate assistant for the university’s Institute of Latino Studies. You can find (or will find) her poetry in Dialogue, Cha, Cobalt, Spark: A Creative Anthology, Ruminate, The Rain, Party, & Disaster Society, Day One, and Silver Birch Press.